The large-scale photographer goes deep down underground for her latest exhibition at the Baltic. Fiona Crisp’s new installation 'Subterrania' is an intricate, multilayered, and insightful look at what we perceive life to be. It is thoughtful body of work exploring the phenomenological experience of an image - its raison d'être so to speak – and questions the relativity of time, of when the image exists – when it was taken, what it is now, what it was before - the history behind the site - that which it was, that which it now is – and what you yourself understand or perceive the images to be. All of these ideas are projected in still images, yet such is their power, they manage to evoke sensors in every part of your subconscious. It is a probing work of art, which, like an iceberg, only reveals the basics of what we think we see. What we cannot see - the unyielding size and strength of the submerged ice – is what Crisp is fundamentally looking at capturing. Dazed Digital: When you picked up a camera was there a Eureka moment where you thought this is interesting? Fiona Crsip: No. I first started using photography as a way of documenting other things that I was doing: sculptures, of installations. The first work where I was more conscious about using photography as a medium was almost like a private performance. I shaved my hair off and then photographed it everyday as it was growing back, and then all the photographs formed a long object. As I started to photograph installations and sculptures I realised that the image was doing something in itself – it wasn’t just documentation – and I started to play around with the idea about how we perceive space. DD: Do you see yourself as a visual philosopher in respects to your photography? Fiona Crisp: I suppose that would be a fair summation of it all actually, it’s a nice way of looking at it. I never trained as a photographer - my background is in sculpture - so it’s been a really interesting argument with photography because I felt more and more compelled and drawn towards using it as a medium. It seems like a perverse medium to try and do something in. I’m interested in what photography can’t do as well as what it can do. I suppose almost by default it has become an exploration of the very basic ideas of photography: of space, of light, of time, and how they exist within the image and how possible it is to take an image of a place, environment, and for that to become something else other than a photograph and how we then respond to it. DD: What attracts you to a location, how do you get there? 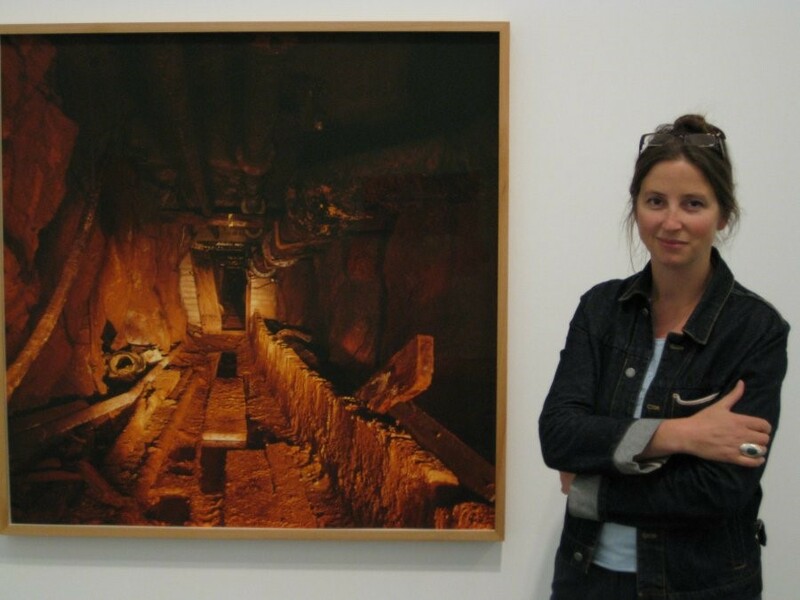 Fiona Crisp: The 'Subterrania' series started with the Catacomb works. I was living in Rome doing a fellowship. I went on one of the tourist trails and was blow away by the environment of the catacombs. Most of them in Rome are not like the catacombs you might find in Paris where you get lots of skulls. In Rome all the human remains have been taken away and you end up with this very sculptural environment. It’s interesting that all these intricate spaces have been made by removing stuff instead of architecture, which is made by building walls. It’s like the difference between construction and carving within a sculptural process, and also, you have architecture that that has no exterior to it. They’re very powerful places to experience but at the same time you have a guide trying to get you to imagine what it would be like to be an early Christian or a 17th century lead miner and it’s bizarre – you have all these conflicting things going on. DD: What is it you find interesting about the places depicted in Subterrania? Fiona Crisp: This whole mix of the conflicting demands of tourism, heritage, leisure, and how we perceive history. I find it really fascinating how all these things work together and against each other. To put the demands of that on what a photograph can or can’t do is fascinating. The works are of places, but there not documents of those places – they don’t have a documentary narrative or truth, they’re not to do with telling a story or a history, and in some sense they could be anywhere. DD: Do you have a specific process of working to capture these ideas? Fiona Crisp: Quite often I start with more than one type of camera and then feel my way through what’s going to be appropriate to that place. Another really important aspect is I still work with film and not digitally. The fact that you don’t know what you got is really important. I photograph, then go away and develop the images, I look at them and I think about them as images, and then I go back to the place and experience the place again, and I to and fro. Through that I am getting the technical quality of the image right. It’s very experimental. I kind of force myself to go back. DD: Do you have anything coming up in terms of new work? Fiona Crisp: In terms of this body of work I have been trying to negotiate access to a mine on the North Yorkshire coast. It’s a working mine but they have a 3 million pound laboratory down there where astrophysicists are trying to find dark matter. 96 percent of the universe is missing and so they’re trying to find what they call wimps and apparently their machines are more sensitive in this environment. I find it really fascinating that they’re trying to find and measure something that is moving everything in our universe but they can’t see it. I hope they give me permission to photograph there, but I don’t know what I’ll do visually, so it’s kind of putting yourself in the position where there’s potential for something interesting and unexpected to happen. Subterrania is at the Baltic until 4 October 2009.